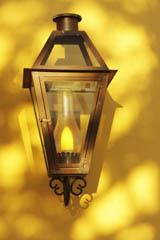 Brass outdoor lighting will add a touch of luxury to your outdoor lighting environment. These outdoor fixtures can compliment modern architecture yet works wonders for more traditional architectural styles. 1) Pierce the darkness providing you with a source of light throughout the night. 2) Be pleasing to the eye by acting as a fashion accessory, adding to the beauty of your outdoor environment. Brass fixtures are widely accepted by most people to help complete the appearance of your outdoor environment. Because of it's strength and ability to sustain corosion well, brass outdoor lighting stands up well to mother nature's demands. Brass fixtures usually require very little maintenance other than periodically making sure the fixture is not leaking, allowing water and moisture to accumulate in the fixture's housing. The good news is that most outdoor lighting manufacturers add a layer of brass lacquer to the fixture as a way to protect the brass from tarnishing too quickly. The bad news is that the lacquer eventually wears off and there begins the tarnishing process. Brass is composed of two metals, copper and zinc. As it is exposed to the outdoor environment it'll begin to darken into a brown color. Eventually as it gets pummled by rainwater it'll change to a blue-green color. 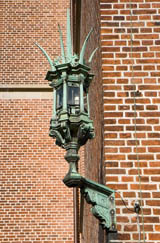 If you own copper outdoor lighting fixtures you will see a similar color change to that of brass fixtures. This is because of the copper makeup of brass. But don't worry if your shiny brass fixtures eventually change color. This is a natural tarnishing process that is expected in brass outdoor lighting fixtures. Its actually desirable for anyone looking for that antique look. If you're looking for antique outdoor lighting fixtures then a tarnished brass fixture is definitely the way to go. Deciding the right fixture for your home is critical in making your outdoor lighting theme work with your outdoor environment. The existing architecture present, the available array of fixture styles, and the overall look and feel of your outdoor environment will determine if brass lighting fixtures work well for you. The existing architectural style present is a factor in determining the right look and feel for your outdoor lighting project. It should give you ideas as to what style oudoor lighting fixtures you should be considering. For example, you may own a victorian style home which would immediately tell you that an antique outdoor lighting fixture may work well for you. The available array of fixture styles will determine if you even end up with brass outdoor lighting fixtures. If you decide that the available selection of antique brass fixtures available won't fit well for your outdoor lighting project, you may need to move away from brass fixtures. Take some time out to really look around and notice everything around you. Look around the neighborhood, whats around? Use what you observed to help inspire you for your outdoor lighting project. You may discover a unique brass fixture that compliments your surrounding environment that you otherwise may have overlooked.